In our house on birthdays or holidays like Father's Day, it's quite common that we kids cook up a big meal, letting our parents (mostly!) relax with a martini on the back porch. This past weekend, my brother took the main stage, whipping up pork and pineapple tacos with black beans and rice in honor of our great Dad. To say it was fab would be an understatement. Kudos, Colin! Placed in charge of the appetizer, I wanted to make sure whatever I chose to make matched up well to the Mexican/Cuban theme he already had going on. 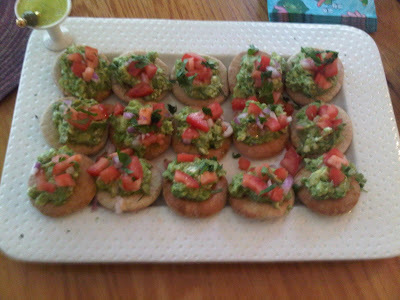 Plus, we were having guests over, so I had make something that was both easy and served a crowd. A quick search later, I landed on what has now become one of our new favorite appetizers. These little babies are gorgeous on the serving platter, and are healthy, too! They require some prep time, since you leave the ingredients out for a bit to let the flavors combine. The goat cheese adds a velvety and tart smoothness to the avocado mixture. This isn't your typical guacamole! Prep: 15 min., Stand: 30 min., Bake: 8 min. 1. Cut avocados in half. Scoop pulp into a bowl, and mash with a fork until chunky. Stir in 2 Tbsp. red onion and next 5 ingredients. Fold in cheese. Place plastic wrap over the bowl, and let stand at room temperature for 30 minutes. 2. Meanwhile, preheat oven to 375°. Place pita rounds on baking sheet in a single layer; drizzle with olive oil. Bake at 375° for 10 minutes. 3. Top each pita with about 1 tbsp. of the avocado mixture. Stir together tomato and remaining 1 Tbsp. red onion. 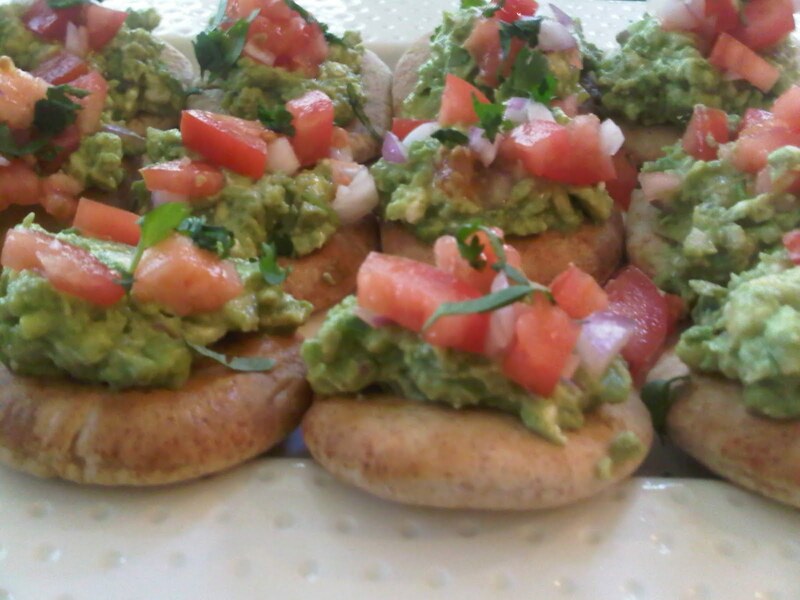 Arrange tomato on top of avocado, and sprinkle with cilantro. Notes from Katherine: The original recipe called for splitting the mini pits in half, but we enjoyed them whole, which also gave a more stable base for the topping. When selecting your ripe avocados, look for ones that are blackened skin and give a little when you grip them. Yummy! Those sounds delish! I'll have to make those very soon! D'aww, t'weren't nothin.' Thanks for the kudos, though! BB - they would perfect for a 4th cookout, since while they taste fab warm, they of course can be room-temp too!